Minami Nakanishi in Art & Photography Culture & Arts Editor's Picks on 11 January, 2018. I guess most people enjoyed your time with families and friends during the vacation. In many countries, there are different games when families get together such as the new year vacation or lunar new year vacation. I am going to introduce the traditional board games played in Asian countries and tools to play them. 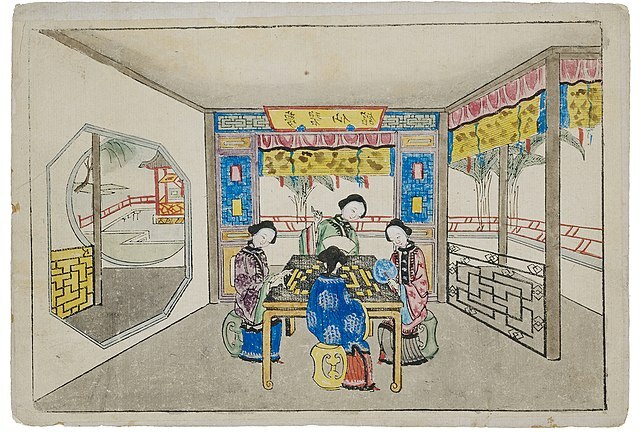 Mahjong is the traditional game in China played since around the eighteenth century and sometimes was used for a gambling. It is similar to rummy, a western card game. 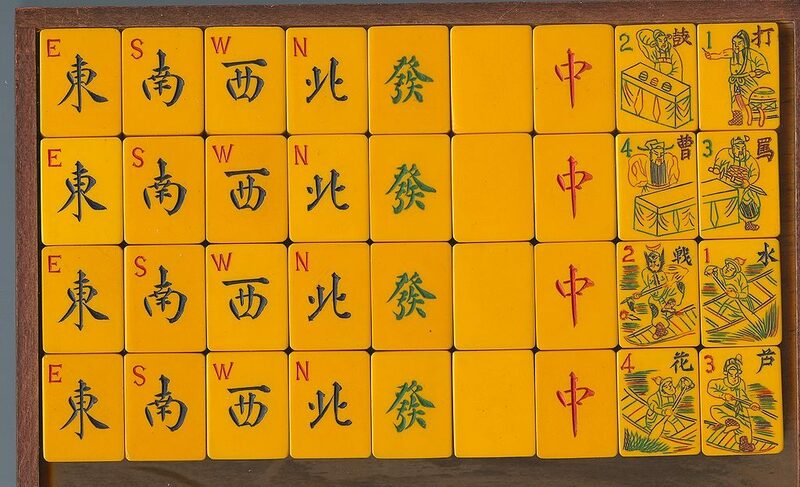 Playing mahjong is still popular and it is played especially on lunar new year holiday. How to play: For this game, 144 tiles are usually used, and 4 people take part in. All players receive 13 tiles, and draw and discard tiles until they can complete 14 tiles by following rules. There are many different rules about the number of tiles and how to use tiles in many regions and countries. On the tiles, some Chinese characters, symbols and pictures are sculptured. Tiles for the upper class are usually made of ceramics, ivory, jade, and silver and the designs on them were unique and sculptured by hands. This one was known as the tile used by Aisin Gioro Pu Yi, the last emperor of China. There are two set of these tiles and the larger one is for men and the smaller one is for women. There was a tradition that men and women cannot play together even the king and the queen. These tiles are called five colours tiles, because inlays of shell are used and the colour changed by a light. There were two types of sugoroku. 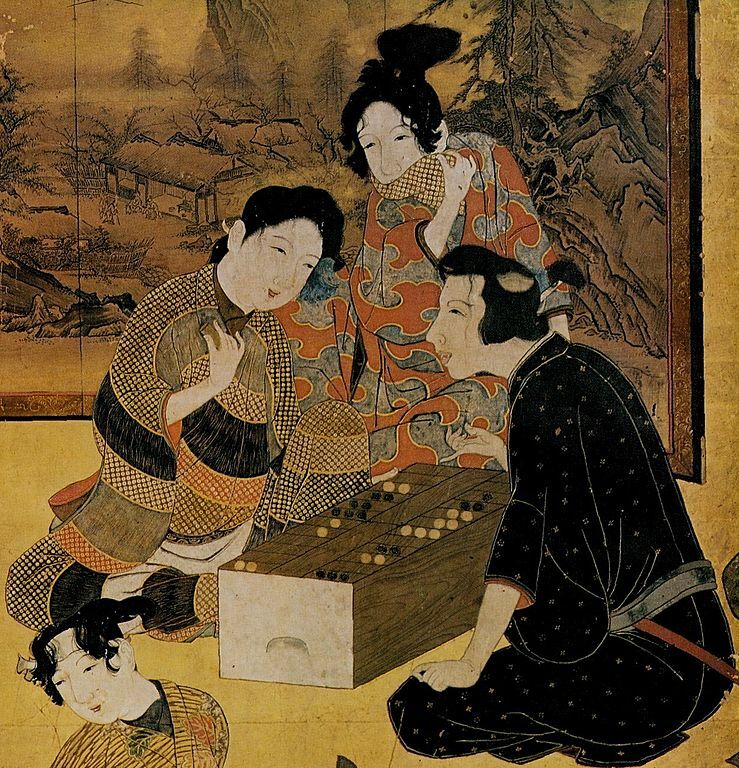 One is called ban sugoroku (board sugoroku) which is similar to backgammon and it was introduced from China in around sixth century and sometimes used for a gambling. 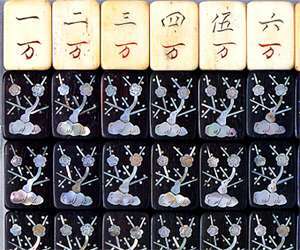 On New Year’s Day, it is popular to play the other one which is called e sugoroku (picture sugoroku) and is similar to Snakes and Ladders. The origin of this is the board game that monks made to teach Buddhism doctrine to their juniors. It becomes cheap and popular since around the seventeenth century thanks to a spread of a woodblock print technology. Many different themes are painted on sugoroku, but since there is a long way to get to the goal, the theme is usually something to do with walking, such as trip or life’s journey. How to play: Players throw a dice in turn and move their pieces according to the number of a dice. Usually there are instructions on each picture and people have to follow them. The first person who can reach the goal wins. 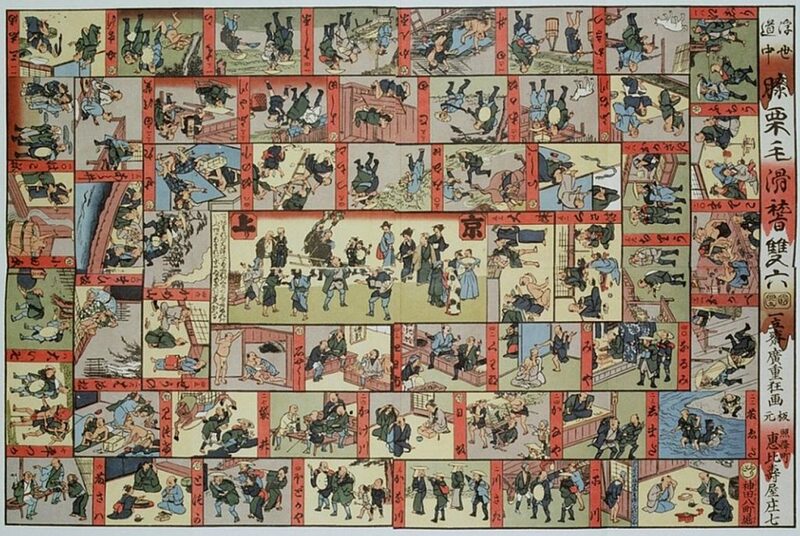 In this sugoroku, the map of Yoshiwara which is the famous prostitution area is painted. People could enjoy it as if they go around the prostitution street. In Japan, it was believed that everything had life because of the animism from ancient times and becomes ghosts if people did not cherish them. 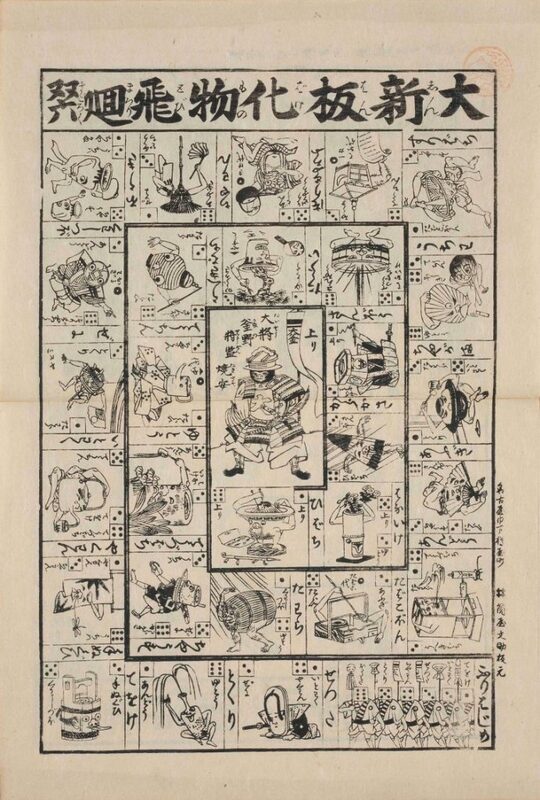 These ghosts are described in this sugoroku,for example, in the center, a ghost of a rice cooker is painted. Moreover, each stop has an instruction that they cannot move from the stop until certain number of a dice comes out. It implies that people cannot move because of the attack by the ghost. Since the seventeenth century, it is popular to travel to the west in Japan by using the road called Tokaido because of many books and pictures were published and influenced on people. 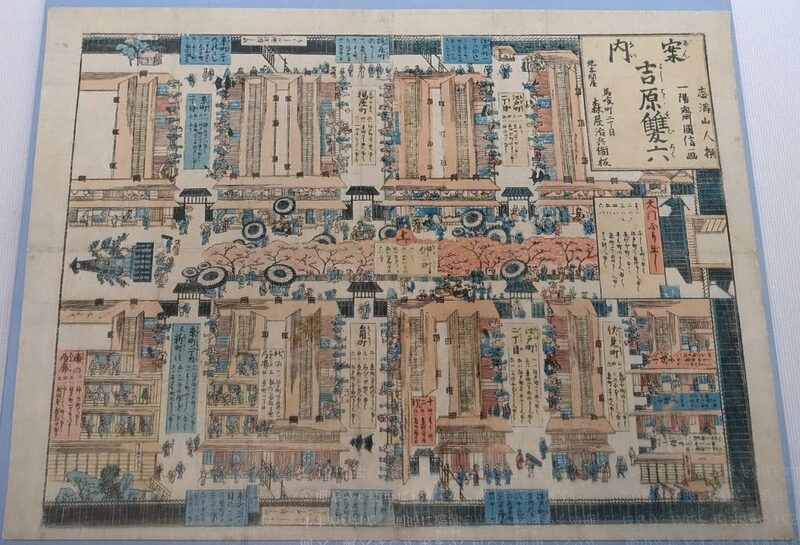 This one is the map to travel from Edo, the old name of Tokyo, to Kyoto which was the biggest city in the west area that the emperor lived in. It was painted by Hiroshige Utagawa who is a famous artist in the nineteenth century and had an influence on western painting as a Japonism. Even though it is small piece of paper, his fine description of nature can be interpreted. 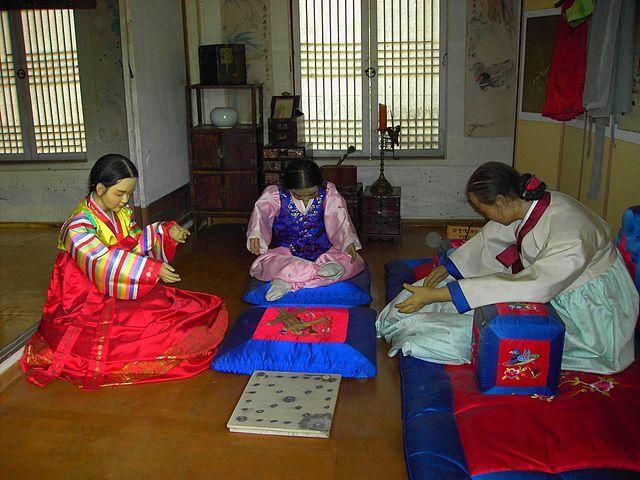 The origin of this game is not sure, but it is considered that it is played since ancient times. It is common to play on Lunar New Year’s Day. 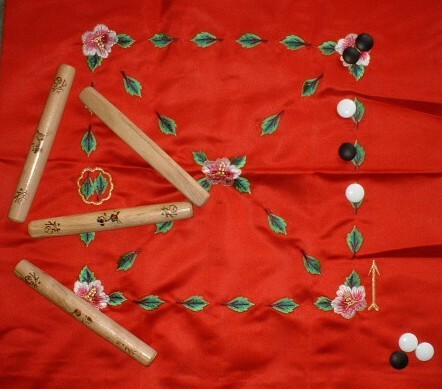 How to play: People are separated in two teams and throw four sticks which is called Yut. The teams move their four pieces according to the state of the stick. Yut is usually made of wood, but for the upper class, ivory was used. The larger one was for men and the smaller was for women. Some tools to play these games are valuable because of their fine painting and sculpture and kept in museums. But they are still popular in these countries and new versions are made and sold. It will be a good opportunity to try them and understand Asian traditional culture. Why don’t you play these games with your families and friends tomorrow if you still have a time or in next vacation?